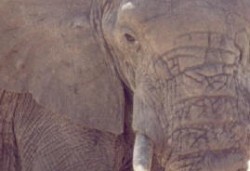 About 30% of Zambia’s 752 614 square kilometers is reserved for wildlife. There are 20 national parks and 34 game management areas in the country. 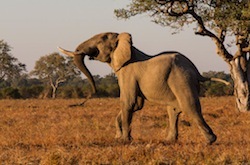 South Luangwa, Kafue and Lower Zambezi rank among the finest game parks in the world. 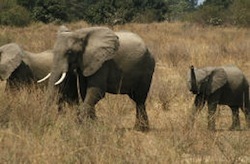 Luambe, and Lukusuzi Liuwa Plain, West Lunga, Sioma Ngwezi, and Nyika Plateau have substantial wildlife but are still undeveloped. 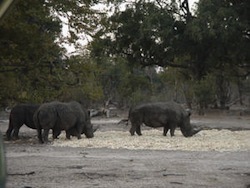 Mosi-oa-Tunya, near Victoria Falls, is regarded as a Zoological park as it has a well managed population of antelope, elephants, giraffe and rhino, but does not have any predators. Isangano, Lavushi Manda, Lusenga Plain, and Mweru Wantipa have never had management or facilities and have little wildlife but are still worth a visit by intrepid explorers and birdlovers. The newest park to be proclaimed is Lusaka National Park, just outside the capital, which opened to the public in June 2015. View the park entry fees. This Park is an undiscovered gem. The vast plains are spectacular in the dry season and transform completely from a dry grass flatland to a watery wonderland in the wet season, as the flats fill with water and the migratory birds arrive from far and wide. 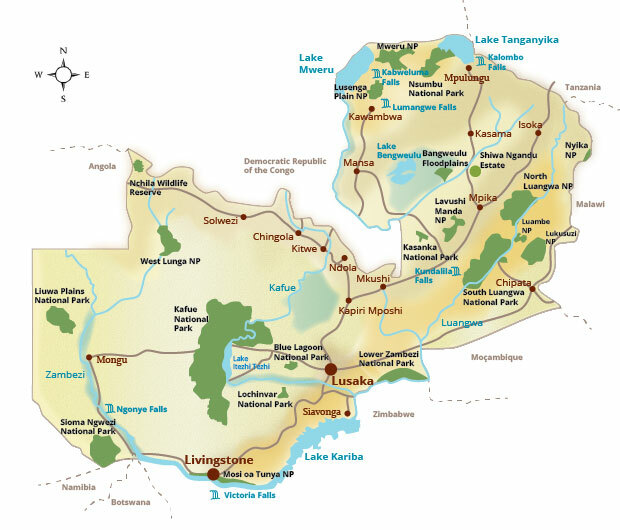 Found in the centre of western Zambia, Kafue National Park is the oldest and largest of Zambia’s national parks covering a massive 22,400km2. This peaceful sanctuary, situated on the south western edge of the Lake Bangweulu basin, is one of Zambia’s smallest national parks. It’s 450 km2 however, are so well endowed with rivers, lakes and wetlands, forests, lagoons, meadows and dambos that it supports a uniquely wide range of animals and abundant birds and fish. This park, although indicated as a National Park on all available maps, is no longer a reserve for wildlife. Most of the animals have been poached out, except for a few herds of antelope on the northern plane. 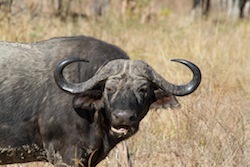 It still has a formidable bird population however, but Tsetse flies are rife. This remote park in the far west is pristine wilderness, which to the ardent bush lover, makes it its biggest attraction and the rewards are great. Lochinvar, although not abundant in the larger mammals, is nonetheless a park of exceptional beauty and outstanding birding opportunities with over 420 recorded species in its 428 square kilometers. This park is still relatively undeveloped, but it’s beauty lies in it’s absolute wilderness state. The diversity of animals is not as wide as the other big parks, but the opportunities to get close to game wandering in and out of the Zambezi channels are spectacular. 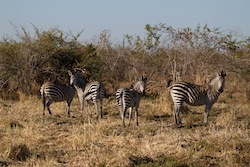 Between the North and South Parks on the east bank of the Luangwa River, is a small park of great vegetative beauty and an ever increasing animal and bird population. A new camp has just been established in this park for the first time. 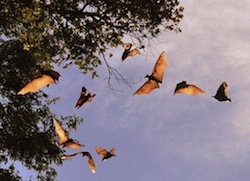 Located on the eastern escarpment of the Luangwa Valley, between the North and South Luangwa Parks. To date this park has had no development or even management and the status of game is uncertain. 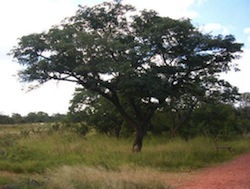 Lusenga Plains National Park is in Luapula province in the North of Zambia. This park has not been operational for many years but it is now being restocked. 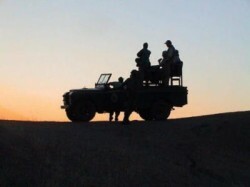 Impala and zebra have been released , and soon wildebeest. 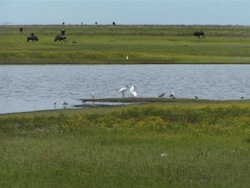 The swampland surrounding Lake Mweru Wantipa in the far northern part of the country is much the same as the swamps of the Bangweulu in its profusion of waterbirds during the rainy season. This remote tract of land covering 4636 square kilometres offers one of the finest wilderness experiences in Zambia, if not Africa itself. There are very few roads and only licenced operators can build temporary camps for walking safaris. 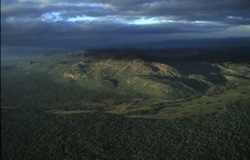 Nyika plateau, a beautiful montane highland area, lies on the Malawian border at the eastern most tip of Zambia. 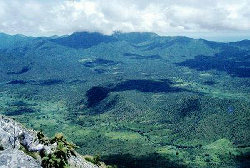 The park is actually an extension of the National Park on the Malawian side which incorporates the rest of the plateau. This 5000 square kilometre park in the south western corner of the country has been completely undeveloped and rarely visited until recently. 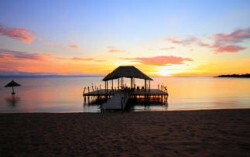 Lying on the southern shores of Lake Tanganyika in the Northern most tip of Zambia, Nsumbu National Park covers an area of just over 2000 square kilometers encompassing 100kms of some of the most pristine shores of this vast Lake. 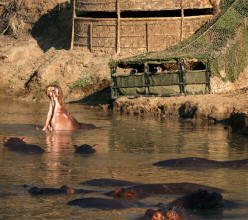 The Mosi-oa-Tunya National Park is situated along the upper Zambezi River. 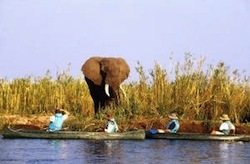 It includes the Victoria Falls and stretches for about 12 kilometres up the Zambezi River above the Falls. 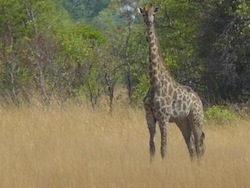 West Lunga National Park is one of Zambia’s less visited Parks. It was proclaimed in the 1940s to protect the population of Yellow-backed Duiker, but it has had little official interest over the years and has mainly been used for hunting and fishing by the local communities.